I am privileged to know individuals who are, have been, or likely will become mental health advocates. In my experience, they are entirely motivated to prevent other people having to experience the degree of pain they have suffered. To do this, they tell their own story. They have stories of recovering from their own mental illness; to remind others that recovery is possible and not to give up. They have stories of a loved one who did not recover; they work to build the services their loved ones didn’t have and they remind us not to give up. They have stories that finding mental health can be an ongoing struggle but not to give up. That is the overwhelming message: Don’t Give Up! 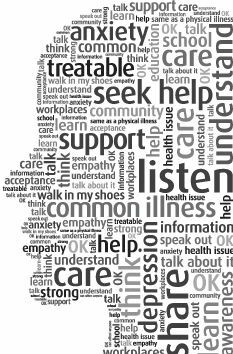 What makes mental health advocacy successful? This study of how mental health advocacy was established in Sierra Leone considers the factors that led to its success and the barriers that it faced. Before this advocacy began, there was almost no consideration of mental health in this poor African country so this elegant study allows us to extrapolate from its prima facie case to our own situation in Canada, where mental health advocacy is not new. A review of the factors that helped and the barriers is striking in that there is little difference between Canada and Sierra Leone. Consider what this means: our mental health advocates in Canada must overcome the same barriers to achieve their goals as those in a country that most would consider to be far less sophisticated. If you talk to a Canadian Mental Health advocate for five minutes, you will find out how evident this is – and how discouraging. Why do mental heal advocates do this work and what do you need to know if this is a path you’ve chosen? This article by Erin Hodgson, who leads the Jack Talks program at Jack.org addresses these two questions. My favourite part of this article are her six self-care strategies. These are important for everyone, but especially important for mental health advocates who, in my experience, give so much to their work. While you’re reading the article, you can find out about Jack.org itself and their important advocacy work with young people. Mental illness comes close to all of us. It doesn’t take the usual six degrees of separation to find someone who has suffered from a mental illness – most of us know well someone who has had a mental illness and, often, we are that person. Personally, my father and two brothers died before I was twelve. My father’s death brought other losses and I am, in many ways, an expert at loss and grieving and they have been my window on mental illness. I consider myself lucky to have suffered no worse affliction. During my days of listening and watching others cope with the heartache and aftermath of mental illness, I am awestruck by people’s persistence and courage. I don’t know if I could manage as they do, I often don’t know how they manage and I consider it a privilege to help them do this. When these people decide that they must work for others, I am always blown away. I have seen too many advocates become overwhelmed by their memories and the task they have chosen for themselves. I also know that the system offers little organized support and so I try to keep my door open for them. I am not trying to be their caregiver, unless it is clearly my job, but I will try to find them the help they need. My goal is to be an enabling factor as described in the Sierra Leone Study, or the nudge to remember the self-help strategies that Hodgson says advocates need. Mental Health Advocates need our support, and by that I don’t mean professional help. I mean they need all of us to remember that they are doing something we could all do if we wanted to, if we had their courage. I am not that brave and so I will support mental health advocacy by supporting them. On Bell Let’s Talk Day, I will be one of the best tweeters and Facebook posters. It’s the least I can do.